We've all looked at blissfully happy couples and thought “Why is he with her?” or “What does she see in him?” We've also been aghast when a couple we were certain would be together forever breaks up. Only the people inside the relationships know the truth. I believe that is one of the lures of romance novels. We are given a front row seat as enduring love begins. We live it along with the characters, in a way we cannot share in real life. 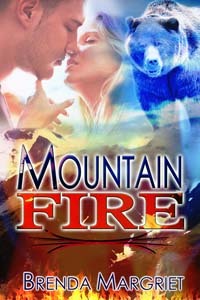 In my debut romantic suspense, MOUNTAIN FIRE, June Brandt, a natural resources student, meets Conservation Officer Alex Weaver when he is investigating the death of a grizzly bear. When one of Alex's colleagues is murdered, June and Alex must work together to find the poacher before other lives are lost. While the mystery is integral to the story, it is the relationship between June and Alex I wanted to explore. On the face of things, Alex and June are well-suited for each other. They are both athletic, resourceful and dedicated to the environment. But June comes from a large, loving family, and wants that same experience for herself someday. Alex, on the other hand, has decided there is no such thing as happy-ever-after, and anyone who thinks so is deceiving themselves. June must decide if she is willing to love Alex on his terms, without trying to change him. And no one is more surprised than Alex when he finds himself wishing for more than he believes possible. June stood on the step, shifting the paper bag she carried from one arm to the other. She flicked a glance at him, not meeting his eyes. The sensations in his stomach had nothing to do with the delicious scent of Chinese takeout wafting in. “Here, let me take that.” He reached for the bag, and when his fingers brushed hers she jumped like she’d been zapped with static. He pretended not to notice, and led her to the tiny dining nook. A bottle of wine waited, uncorked, next to two thin stemmed glasses with elegantly wide bowls. Tall tapered candles shone with a steady glow. A single rose lay across one plate. She delicately caressed a velvety red petal. She slid the silky blossom against his lips, and he stopped. “Thank you,” she said, and replaced the rose with her mouth. What I like best about romantic suspense is that something is always about to happen or is happening. The hero & heroine are active in forging their relationship and battling evil. It is the only genre that keeps me interested start to finish and, I admit, at times "swooning" over the hero. I do believe that most romantic suspense, and romance in general, books contain tension between the protagonists. Unfortunately, in some books the only tension is sexual tension. While sexual tension is necessary,some books state every other page how hot each other is that the plot is reduced to window dressing. I do believe that relationships can suceed even though others wonder what the couple is doing together. I tell my daughter all the time that noboby knows the truth about a relationship except the people in it. Good excerpt. All over again!! And, ooh, it is a great excerpt!! Congrats to Brenda on her new release! Thanks for sharing a great post and excerpt! I like the action and I feel like the romance is deeper and more meaningful b/c it's not bogged down by the fluff and hem haw. Thanks for the comments, everyone. Glad you enjoyed the excerpt! In romantic suspense the hero & heroine have so much more to overcome. Outside forces at work.